If you are in the market for a new microscope, you may notice a number of different types of lights in microscopes. It can be confusing to differentiate between all the options. This post will help you understand the differences in microscope light bulbs. Tungsten Microscope Light - A tungsten light bulb is generally the least expensive type of light found in a microscope. This type of light is bright and it heats up. If you plan to view any living specimens, the heat from the light bulb can kill the specimens and make them stop swimming. Fluorescent Microscope Light - A fluorescent light bulb is a cool light. Perfect for viewing specimens that are fragile and temperature sensitive. The light is generally not quite as bright as a halogen or LED light and in some older fluorescent light microscopes, the light would sometimes flicker. Halogen Microscope Light -A halogen light bulb is very bright, sometimes with a soft slightly yellow hue to it. The halogen bulb does tend to heat up, so again, fragile specimens might not be best under this light. LED Microscope Light - An LED light bulb is the newest addition to microscopy lights. LED light bulbs produce a very bright, white light. They are cool, so no damage to specimens takes place, and the light bulbs tend to last a very long time before they need to be replaced. 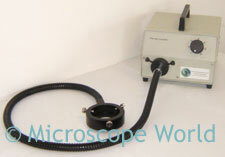 The image above is a 150w halogen fiber optic ring illuminator, often used with a stereo microscope. Although this illuminator uses a halogen light, because the bulb is housed in the light box (with a fan), the illumination that comes out of the ring light is cool and will not heat specimens. If you are unsure of the correct light for your microscope needs, give Microscope World a call at 800-942-0528 and we will be happy to assist you.